(New Britain, Conn., Mar. 22, 2018) – With the 2018 season on the horizon, the Bees are happy to announce a special ticket deal for all 13 Firework Extravaganzas! Get your hands on the most affordable mini plan the New Britain Bees have to offer, equaling out to under $7 per ticket! 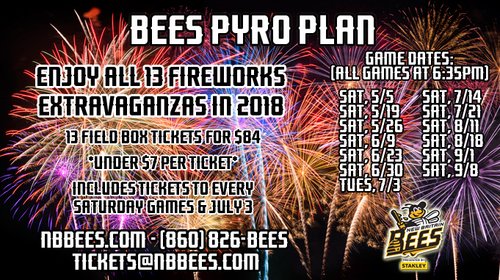 The Pyro Plan includes a package of 13 Field Box tickets for just $84, and guarantees you a great seat for all of the New Britain Bees Firework Extravaganzas! This includes all Saturday home games in addition to a special Independence Eve Fireworks show on Tuesday, July 3. What better way to spend a fun night than with the Bees! For more information or to purchase your Pyro Plan, please CLICK HERE, call the Bees Ticket Office at 860-826-BEES, or email tickets@nbbees.com.